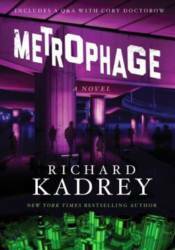 Richard Kadrey�s first novel now back in print after twenty years in a special signed, collectible edition. Welcome to the near future: Los Angeles in the late 21st century�a segregated city of haves and have nots, where morality is dead and technology rules. Here, a small group of wealthy seclude themselves in gilded cages. Beyond their high security compounds, far from their pretty comforts, lies a lawless wasteland where the angry masses battle hunger, rampant disease, and their own despair to survive. Jonny was born into this Hobbesian paradise. A street-wise hustler who deals drugs on the black market�narcotics that heal the body and cool the mind�he looks out for nobody but himself. Until a terrifying plague sweeps through L.A., wreaking death and panic. And no one, not even a clever operator like Jonny, is safe. His own life hanging in the balance, Jonny must risk everything to find the cure�if there is one. The book includes a Q & A with Cory Doctorow.